WASHINGTON (CNS) — The seven Catholic peacemakers who entered a naval base to symbolically dismantle nuclear weapons-armed submarines acted from the primacy of conscience rooted in their faith, the bishop of Jackson, Mississippi, told a Georgia court. 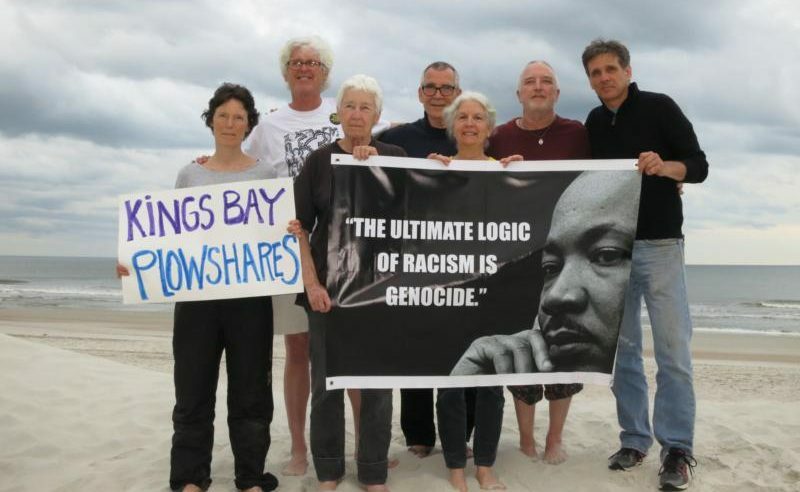 Testifying as an expert witness on behalf of the Kings Bay Plowshares activists, Bishop Joseph R. Kopacz said their actions were consistent with long-standing Catholic teaching about the sinfulness of nuclear weapons. The bishop took the stand during a Nov. 7 hearing before Magistrate Judge Benjamin Cheesbro of the U.S. District Court in the Southern District of Georgia. The hearing was scheduled to present evidence explaining why the seven longtime activists entered Naval Submarine Base Kings Bay April 4. The defendants include Elizabeth McAlister, 78, of Baltimore; Jesuit Father Steve Kelly, 69, of the Bay Area in California; Carmen Trotta, 55, of New York City; Clare Grady, 50, of Ithaca, New York; Martha Hennessy, 62, of New York, granddaughter of Catholic Worker co-founder Dorothy Day; Mark Colville, 55, of New Haven, Connecticut; and Patrick O’Neill, 61, of Garner, North Carolina. The defendants are seeking to have federal charges of conspiracy, trespass, and destruction and depredation of property dismissed under the Religious Freedom Restoration Act. They have argued in court filings that their action is protected under the law. The seven entered the submarine base, the East Coast home of the Trident nuclear submarine, and during approximately two hours placed crime scene tape and spilled blood at different locales while posting an “indictment” charging the military with crimes against peace, citing the Nuclear Non-Proliferation Treaty. The Navy’s fleet of Trident submarines carries about half of the U.S. active strategic nuclear warheads, according to military experts. Bishop Kopacz cited the U.S. Catholic bishops’ 1983 pastoral letter on peace and nuclear weapons, “The Challenge of Peace: God’s Promise and Our Response,” during his testimony. He said the document allowed for the temporary possession of nuclear weapons only as a step toward disarmament, and that after more than 30 years that goal has not been achieved. He described the seven as a “spiritual special ops team” working to make a change. A day prior to his testimony, Bishop Kopacz told Catholic News Service he was supportive of such actions to rid the world of nuclear weapons although he would find it difficult to take such a step himself. “I believe in what they do. I believe what they’ve done is a courageous witness and very prophetic,” he said. The court also heard from Jeannine Hill Fletcher, professor of theology at Fordham University. She discussed papal encyclicals and the documents from the Second Vatican Council that “condemn” the use of nuclear weapons. She also addressed why actions of conscience, such as those of the defendants, are important in modern-day society. Grady told CNS Nov. 8 that on the stand she explained her family’s background and the long history of work for peace and justice extending from their Catholic faith. Protesting nuclear weapons, she said she told the court, was a natural extension of her faith practice and that her conscience guided her to act for peace. “For me there’s a geography to our faith, and what I experienced in that courtroom was a Catholic revival because of our choice to act in a certain geography, the geography of the courtroom and all that is the Gospel. You could feel the energy from all of that,” she said of the hearing. Father Kelly, who remained jailed, testified that the actions of the group amounted to preaching God’s word that nuclear weapons are “sinful.” He said the world faced a crisis because of the presence of such weapons. Near the end of the daylong hearing, federal prosecutors called the commanding officer of the naval base to the stand. Capt. Brian Lepine described the importance of maintaining tight security at the base and the danger posed by anyone illegal entering the base perimeter. After more than eight hours of testimony, Cheesbro said the hearing would be continued on a date still to be determined.